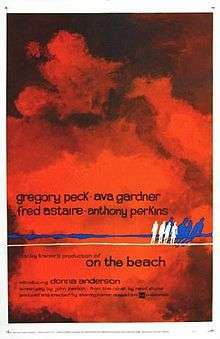 On the Beach is a 1959 American black-and-white post-apocalyptic science fiction drama film from United Artists, produced and directed by Stanley Kramer, starring Gregory Peck, Ava Gardner, Fred Astaire and Anthony Perkins. The film is based on Nevil Shute's 1957 novel of the same name depicting a nuclear war and its aftermath. Unlike the novel, no blame is placed on whoever started the war; it is hinted in the film that the threat of annihilation may have arisen from an accident (for example, a fault in a few vacuum tubes or transistor circuits, as in the similarly themed 1964 film Fail-Safe). During 1964, in the months following World War III, the conflict has devastated the Northern Hemisphere, polluting the atmosphere with nuclear fallout, killing all life there. Air currents are slowly carrying the fallout south; the only areas still habitable are in the far reaches of the Southern Hemisphere. From Australia, survivors detect an incomprehensible Morse code signal coming from the West Coast of the United States. The last American nuclear submarine, USS Sawfish, under Royal Australian Navy command, is ordered to sail north to the United States to attempt to make contact with the sender of the Morse signal. The submarine is commanded by Captain Dwight Towers (Gregory Peck), who must leave his new friend, the alcoholic Moira Davidson (Ava Gardner). The Australian government arranges for its citizens to receive suicide pills or prepared injections so they may end things quickly before there is prolonged suffering from radiation sickness. An Australian naval officer, Peter Holmes (Anthony Perkins) and his wife, Mary, who is in denial about the impending disaster, have a baby daughter. Assigned to travel with the American sub for several weeks, Peter tries to explain to Mary how to euthanize their baby and then kill herself in case he is not yet home when the end comes; Mary reacts very emotionally to the prospect of killing her daughter and herself. One scientist's theory is that the radiation level near the Arctic Ocean could be lower than that found at the mid-Northern Hemisphere, which might indicate the radiation could disperse before reaching the Southern Hemisphere. The theory is to be explored along with the submarine's main mission. After sailing to Point Barrow, Alaska, they determine that radiation levels are, on the contrary, intensifying. The next day, the Sawfish arrives in the San Francisco Bay Area, just off San Francisco. Through the periscope, Captain Towers sees that while the city has escaped nuclear annihilation due to anti-missile defenses during the war, there appears to be no sign of any human life. Ralph Swain, one of the crewmen of the sub who has family in San Francisco, defies Captain Towers' orders by leaving the sub and going ashore into the city to look for his family, in the hopes that they have survived the radiation fallout and are still alive. The next morning, through a speaker from the Sawfish while he is fishing from a boat in the bay, Swain tells Captain Towers that while he did find his family, they are all dead like everyone else, apologizes for defying him, and announces his decision to spend his remaining last days on Earth in San Francisco (with the assurance that he can just go to San Francisco's many drugstores if he gets sick). Captain Towers understands Swain's motives and forgives him (even adding that there are no laws as to when Swain will eventually succumb to radiation sickness), but explains that they will not be coming back, and so Swain watches as the Sawfish submerges and leaves for San Diego, its next port of call. Near San Diego, the source of the radio signals, communications officer Lieutenant Sunderstrom goes ashore in a radiation and oxygen suit. He has only three hours and will be alerted by a siren from the sub every hour. He discovers that the mysterious signal comes from a power station, but it is not a human survivor —- just a tilted Coca-Cola bottle hanging by its neck from an open window shade's pull cord; random ocean breezes bump the bottle against a "live" telegraph key to send the random signals. Sunderstrom stands the bottle upright and uses proper Morse Code to send a message describing the bleak situation. He returns to the sub before the third hour is up. Sawfish and her crew return to Australia and try to enjoy what pleasures remain to them before the end. Scientist Julian Osborn (Fred Astaire) wins the Australian Grand Prix in which many racers, with nothing left to lose, die in various accidents. Dwight and Moira embark on a weekend fishing trip in the country. Retreating to the resort for the night, they share a romantic interlude inside their room as, outside, a gathering storm howls. Returning to Melbourne, Towers learns one of his crew has developed radiation sickness; the deadly radiation has arrived in Melbourne. Osborn kills himself by carbon monoxide poisoning in his closed garage, with his race car's engine running. Others line up to receive their suicide pills. Mary Holmes becomes emotionally unbalanced and must be sedated. Later, she regains lucidity in time for her, Peter and their baby daughter to face the end by consuming the fatal drug. Dwight wants to stay with Moira, but many of his remaining crew want to head for home to die in the U.S.; Commander Towers chooses his duty over his love for Moira and joins his crew as they attempt to make it back to the radioactive ruins of America. Moira watches as the USS Sawfish leaves Australian territorial waters and then submerges for the final voyage home. Within a few days, the last pocket of humanity is dead and Melbourne is entirely deserted. The deserted, windblown streets of Melbourne are punctuated by the rise of dramatic, strident music over a single powerful image of a previously seen street banner that pleads to the world, to the future: "There is still time... Brother." Nuclear war and the end of humanity can still be prevented. The "Australian Grand Prix" in the novel had the racing sequences filmed at Riverside Raceway in California and at Phillip Island Grand Prix Circuit, home to the present day Australian motorcycle Grand Prix, conveniently located near Cowes at Phillip Island. These scenes include an array of late 1950s sports cars, including examples of the Jaguar XK150 and Jaguar D-type, Porsche 356, Mercedes-Benz 300 SL "Gullwing", AC Ace, Chevrolet Corvette and prominent in sequences was the "Chuck Porter Special", a customized Mercedes 300SL. Built by Hollywood body shop owner Chuck Porter and driven by a list of notable 1950s to 1960s west coast racers, including Ken Miles and Chuck Stevenson, who purchased and successfully raced it in the early 1960s. The U.S. Department of Defense refused to cooperate in the production of the film, not allowing access to its nuclear-powered submarines. [Note 3] Additional resources were supplied by the Royal Australian Navy, including the use of the aircraft carrier, HMAS Melbourne. It has often been claimed that Ava Gardner described Melbourne as "the perfect place to make a film about the end of the world." However, the purported quote was actually invented by journalist Neil Jillett, who was writing for the Sydney Morning Herald at the time. His original draft of a tongue-in-cheek piece about the making of the film said that he had not been able to confirm a third-party report that Ava Gardner had made this remark. The newspaper's sub-editor changed it to read as a direct quotation from Gardner. It was published in that form and entered Melbourne folklore very quickly. Frank Chacksfield's orchestral performance of the love theme from On the Beach was released as a single in 1960. The song "Waltzing Matilda" became popular everywhere, as a result of the film, with many folk singers recording their own versions, including Harry Belafonte, Jimmie Rodgers (who had recorded two different versions of the song), and Tim Morgan. The Seekers, who are from Australia, recorded this song several times. On the Beach was remade in 2000 as an Australian television film by Southern Star Productions, directed by Russell Mulcahy and starring Armand Assante, Bryan Brown and Rachel Ward. Nevil Shute was displeased with the final cut of the film, feeling that too many changes had been made at the expense of the story's integrity. After initial collaboration with Kramer, it was obvious that Shute's concerns were not being addressed; subsequently, he provided minimal assistance to the production. Gregory Peck agreed with Shute but, in the end, producer/director Stanley Kramer's ideas won out. Shute felt that having Captain Towers and Moira's love affair ruined a central element of the novel. In the novel it has been two years since the last nuclear attacks, and small pockets of human survivors are mentioned in several areas of the Southern Hemisphere. Australia is in radio contact with places such as Montevideo on the east coast of South America and Cape Town on the southern tip of Africa. Commander Towers is in communication with the only other remaining active-duty US Navy vessel: another nuclear submarine, USS Swordfish, on duty in the Atlantic and which, at the end, is based in Montevideo. Melbourne, where much of the novel is set, is the southernmost major city in the world and so will be the last such to go, but people in New Zealand, Tierra del Fuego and other, more southerly points than Australia are said to have a few additional weeks left to them. In the film an unidentified radio newscaster says that, as far as is known, Australia is home to the last human life on the planet, possibly to build hope among the audience that the San Francisco expedition will result in the discovery of other survivors, adding a sense of urgency and importance to the survivors in Melbourne. There is no Swordfish in the film, making the Sawfish the last (known) hope for humanity. In the novel the submarine is named USS Scorpion, but in the film she is called Sawfish. The film production crew was forced to use a non-nuclear, diesel-electric Royal Navy submarine, HMS Andrew. Several major and minor characters were altered, removed, or created specifically for the film version. The novel's Moira Davidson, a slender, petite pale blonde in her mid-20s, was portrayed by the tall, curvaceous, 36-year-old brunette Ava Gardner. Nuclear scientist John Osborne, a 20-something bachelor in the novel, is portrayed in the film by 60-year-old Fred Astaire and is named Julian Osborn. Moira and John are cousins in the novel, while Moira and Julian are former lovers in the film. Admiral Bridie and his secretary, Lieutenant Hosgood, are film characters that are not in the novel. In the film random Morse code radio signals coming from San Diego give rise to hope that there are survivors on the US west coast. In the novel the signals are coming from a naval training base farther north, near Seattle. The idea of a survivor sending random code is forthrightly dismissed in the novel as ridiculous; Towers says that even someone who didn't know Morse code would sit there with a Morse book and send at about five words per minute. The film's characters however, hold out hope that there could be a human being on the other end of the telegraph, possibly as a plot device used to build suspense and hope among the audience. The main reason in the novel for the expedition is to learn if there are indeed survivors, but rather than a telegraph operator, the characters hold out hope that without the intercession of technicians and maintenance workers, the possibility of power being supplied to the telegraph after all that time would be remote at best. It turns out that, as in the film, the power station has been running on its own since the war, but is beginning to break down from lack of maintenance, particularly the lubrication needed to prevent overheating. Just as in the film, the power station is shut down before the submarine sets sail back to Melbourne. In the film San Francisco's buildings are completely undamaged; a memorable shot occurs when the Sawfish first passes under the intact Golden Gate Bridge. In the novel the city has been largely destroyed and the bridge has fallen into the bay. The northernmost point of the submarine's journey is the Gulf of Alaska in the novel, while the film uses Point Barrow. Towers and Moira attend the "Australian Grand Prix" in the film. In the novel they are vacationing in the mountains on the day of the race, and they hear a radio report of John Osborne's first-place finish. The novel ends with a dying Moira sitting in her car, having taken her suicide pills, while watching Scorpion head out to sea to be scuttled. Unlike the novel, no mention of scuttling the submarine is made in the film; instead Commander Towers's crew asks that he attempt to take them home to the U. S., where they can die on their home soil. Although he realizes that they probably will not survive a second passage north, he does as they request. In the film Ava Gardner is merely watching Dwight's submarine submerge and disappear under the sea and is not shown taking her suicide pills. On the Beach premiered simultaneously in 18 theaters on all seven continents on December 17, 1959. The Hollywood premiere was attended by the film's stars, Fred Astaire and Anthony Perkins, director Stanley Kramer, in addition to other celebrities, including Cary Grant. The New York premiere was attended by Mayor Robert F. Wagner, Jr.. The London premiere was attended by Soviet Ambassador to the United Kingdom Yakov Malik. Star Ava Gardner attended the Rome premiere. The Tokyo premiere was attended by members of the Japanese Royal Family. The Stockholm premiere was attended by King Gustav VI. The Melbourne premiere was attended by Premier of Victoria Henry Bolte. Other premieres were held in West Berlin, Caracas, Chicago, Johannesburg, Lima, Paris, Toronto, Washington, D.C. and Zurich The film was even screened in a theater at the Little America base in Antarctica. Although the film did not receive a commercial release in the Soviet Union, a special premiere was unprecedentedly arranged for that night in Moscow. Gregory Peck and his wife traveled to Russia for the screening, which was held at a workers' club, with 1,200 Soviet dignitaries, the foreign press corps, and diplomats including U.S. Ambassador Llewellyn Thompson attending. On the Beach recorded a loss of $700,000. Despite this, the film was praised in its day and in later years. It also acquired a fan base that agreed on many of the issues presented. Bosley Crowther in his contemporary review in The New York Times saw the film as delivering a powerful message. "In putting this fanciful but arresting story of Mr. Shute on the screen, Mr. Kramer and his assistants have most forcibly emphasized this point: life is a beautiful treasure and man should do all he can to save it from annihilation, while there is still time. To this end, he has accomplished some vivid and trenchant images that subtly fill the mind of the viewer with a strong appreciation of his theme." The review in Variety was not as positive. "On the Beach is a solid film of considerable emotional, as well as cerebral, content. But the fact remains that the final impact is as heavy as a leaden shroud. The spectator is left with the sick feeling that he’s had a preview of Armageddon, in which all contestants lost." In a later appraisal of both novel and film, historian Paul Brians (Nuclear Holocausts: Atomic War in Fiction, 1895-1964 (1987) considered the novel "inferior" to the film. His contention was that the portrayal of nuclear annihilation was more accurate as it was clear that the world was coming to an end. On the Beach (2000) is a made-for-television film directed by Russell Mulcahy and starring Armand Assante, Bryan Brown, and Rachel Ward. It was originally aired on Showtime. The remake of the 1959 film was also based on the 1957 novel by Nevil Shute, but updates the setting of the story to the film's then-future of 2005, starting with placing the crew on the fictional Los Angeles-class USS Charleston (SSN-704) submarine. The 2013 documentary Fallout by Melbourne filmmaker Lawrence Johnston explores Shute's life and Kramer's making of On the Beach, with interviews of Shute's daughter, Kramer's wife, Karen, and Donna Anderson, one of the film's last surviving cast members. Fallout was produced by Peter Kaufmann. ↑ Gregory Peck's son, Cary, had a cameo in the film. ↑ An additional scene was shot in the Melbourne night club Ciro's. Among the audience in the scene were several popular Melbourne television personalities, most notably Graham Kennedy. The scene was not used in the cinema release of the film, and does not feature in the various DVD releases; it is not known if the scene was included in any released version of the film. ↑ Researcher Andrew Bartlett noted: "The American government complained of Kramer’s On the Beach (1959) that it inaccurately presented the threat of extinction from nuclear war because there were not then enough weapons to cause extinction." 1 2 Balio 1987 p. 144. ↑ Mitchell 2001, pp. 177–183. ↑ Weaver 2011, pp. 62–71. ↑ Mitchell 2001, p. 182. ↑ "Original print information: On the Beach (1959)." Turner Classic Movies. Retrieved: January 1, 2015. ↑ "Melbourne: Melway street map". Melway, 1969. Retrieved: January 1, 2015. ↑ "On the Beach, Movie, 1959." Internet Movie Cars Database, May 26, 2010. Retrieved: January 1, 2015. 1 2 Bartlett, Andrew. "Nuclear Warfare in the Movies". Anthropoetics, Volume 10, Issue 1, 2004. ISSN 1083-7264. ↑ Lind 1986, p. 237. ↑ Gillett 1980, p. 29. ↑ Thompson, Nathaniel. "Articles: On the Beach (1959)." Turner Classic Movies. Retrieved: January 1, 2015. ↑ "Review" (lift-out magazine). The Weekend Australian, December 18–19, 1999. ↑ Clarke, Roger. "Musical Performances of Waltzing Matilda." rogerclarke.com, December 3, 2003. ↑ Turegano, Preston. "Beach's passion doesn't run deep, as radioactive love boat founders." The San Diego Union-Tribune, May 28, 2000, p. TV3. ↑ Mitchell 2001, p. 181. ↑ Dawson-Taylor, David. "On the Beach." Nevilshute.org. Retrieved: January 1, 2015. ↑ Shute 1957, p. 117. ↑ Shute 1957, p. 23. ↑ Lindsey, D. "“Book vs. Film: On the Beach.” themotionpictures.net, August 7, 2013. ↑ Shute 1957, pp. 144–157. ↑ "On The Beach (1959, Ava Gardner, Gregory Peck)." Youtube. Retrieved: January 1, 2015. ↑ Fishgall 2002, p. 208. ↑ Fishgall 2002, p. 211. ↑ Crowther, Bosley. "On the Beach (1959)." The New York Times, December 18, 1959. ↑ "On the Beach." Variety, December 31, 1958. ↑ Weaver 2011, p. 64. ↑ Moliltorisz, Sacha. "TV & Radio: On the Beach." The Sydney Morning Herald, April 19, 2007. Retrieved: January 11, 2015. ↑ Kronke, David. "'Beach': It's the end of the world as we know it." Los Angeles Daily News, May 28, 2000. Retrieved: January 11, 2015. ↑ Luke Buckmaster, Fallout movie review: science to art and back again Crikey, July 28, 2013. Retrieved August 17, 2015. ↑ Philippa Hawker, Fallout endures from '50s classic Sydney Morning Herald, October 31, 2013. Retrieved August 17, 2015. Balio, Tino. United Artists: The Company That Changed the Film Industry. Madison, Wisconsin: University of Wisconsin Press, 1987. ISBN 978-0-29911-440-4. Fishgall, Gary. Gregory Peck: A Biography. New York: Scribner, 2002. ISBN 978-1-45169-849-7. Gillett, Ross. HMAS Melbourne: 25 Years. Sydney, NSW: Nautical Press, 1980. ISBN 0-949756-00-8. Lind, Lew. The Royal Australian Navy: Historic Naval Events Year by Year (2nd ed.). Frenchs Forest, NSW: Reed Books 1986, First edition 1982. ISBN 0-7301-0071-5. Mitchell, Charles P. "On the Beach (1959)." A Guide to Apocalyptic Cinema. Westport, Connecticut: Greenwood Press, 2001. ISBN 978-0-31331-527-5. Shute, Nevil. On The Beach. New York: William Morrow and Company, 1957. Weaver, Roslyn. "Nevil Schute: On the Beach (1957)." Apocalypse in Australian Fiction and Film: A Critical Study. Jefferson, North Carolina: McFarland & Company, 2011. ISBN 978-0-7864-6051-9.